The Department of State strongly urges U.S. citizens to avoid tourism and non-essential travel to Chile. Official VIP travel to Chile, however, is still on. I'm not a fan of all things British - not the modern things, anyway - but I do absolutely love the in-your-face rhetorical style of UK politicians. Not for them the dreary, can't-we-all-get-along, insincere collegiality usually displayed by U.S. Congressmen and Senators. If a UK political leader such as Nigel Farage has something to say to the President of the European Union, Mr. Herman van Rompuy, he will say it in a manner that would start a bar fight in certain other surroundings. Mr. Farage begins the engagement by insulting Mr. Rompuy's appearance, then proceeds to ask a rhetorical question - who are you and who elected you? - followed by a backhanded compliment - "I sense, though, that you are competent and capable and dangerous" - before answering his own question by saying that Mr. Rompuy intends to be "the quiet assassin of European democracy and of the European nation states." Next, Mr. Farage delivers a follow-through punch by insulting Mr. Rompuy's home country of Belgium, and finally concludes by saying on behalf of the majority of the British people "we don't know you, we don't want you, and the sooner you are put out to grass, the better." A verbal smack-down delivered British Bulldog style. Ah, this is bracing stuff. The dust has barely settled from Haiti's earthquake, but today an even more massive earthquake - one of 8.8 magnitude - hit Chile. Around 9:45 this morning I heard a quick television news comment to the effect that all members of U.S. Embassy Santiago have been accounted for, but I can't find any official confirmation of that yet. Looking around the embassy website, I see the mission has conscientiously prepared the expatriate American community for emergencies of this very type. Here's some good advice they sent out to citizens ("The Consular Section of the Embassy has developed this site to provide the American community in Chile with useful, accurate information about preparing to confront earthquakes and other disasters") and to embassy employees. The fact that Chile has a few noticeable earthquakes every year means that people are likely to take that sort of advice seriously, and casualties are likely to be minimal. Here's hoping. The Pacific Tsunami Warning Center is tracking the wave that followed this morning earthquake, and has sent a warning message (here) to the State of Hawaii. The wave or waves should start hitting Hawaii around 11:19 HST (4:19 PM Eastern Standard Time), and they should be viewable over Honolulu web cams. The U.S. Department of State has just put up a 'person finder' for victims of the earthquake. According to a Tweet from Travel.Gov "There have been no reports of American citizen fatalities or injuries in Chile." If I heard that some employees in a U.S. government office had expressed concern "that violence in the workplace could result because of the high levels of workplace animosity and tension," I would be surprised, but not disbelieving. There are some toxic workplaces, I know. But is one of them the State Department's Bureau of Public Affairs? Surely it's not that bad (?). An internal State Department report says the agency's work in publicizing administration foreign policy and its relations with the media have been hurt by poor communication, lack of staffing and uneven leadership in the Bureau of Public Affairs. A review by the department's inspector general found that some employees had been instructed not to return phone calls to reporters asking sensitive questions and that the environment in one office was so tense and hostile that several workers fear violence. The report, which was completed last week, was obtained on Thursday by The Associated Press. The 63-page document also found that the duties of some career employees in the press office had been transferred to political appointees, which contributed to low morale. The report was compiled last fall, months after Hillary Rodham Clinton took the helm at the State Department. "It's a tough report," said P.J. Crowley, the assistant secretary of state for public affairs who runs the bureau. "What the report shows is that the bureau has many strengths, but it clearly has some organizational weaknesses that we are aggressively trying to correct." He said corrective action had already been taken on about a third of the problems identified in the report. The inspector general conducts periodic reviews of each department bureau. The work of the Bureau of Public Affairs is deemed critical to the administration's ability to communicate its foreign policy to the American taxpayer and foreign governments and their publics. The review praised the skill and professionalism of the spokesmen - both career diplomats and political appointees - who brief reporters daily from the podium at the department's headquarters. It also lauded the bureau's attention to new media and its use of social networking platforms to get out the Obama administration's message. But it said the operation needed better direction and that a senior front office position empty for more than a year should be filled immediately as its vacancy "contributes significantly to weak bureau management and low morale. At lower levels, the report said the Office of Press Relations, which in previous administrations has been a primary channel for answering inquiries from the media, had lost much of its role because Clinton's team believed it was not effective. "Thanks to a perfect storm of administration transition, weak leadership, miscues, misunderstanding, personality conflicts and poor communication, PRS has been marginalized," it said, referring to the press office by its acronym. The report said the office also may have lost credibility because it had been instructed not to respond to certain questions from reporters. "Under direction from the front office, PRS does not return some reporters' calls, for inquiries that are deemed sensitive," it said. Crowley denied there was a policy to ignore certain reporters' phone calls but said in some cases inquiries would be passed along to the front office, adding that calls are returned. The report's most damaging findings involve the Office of Broadcast Services, which produces and distributes audio and video content to worldwide media outlets. That office, it said, is beset by severe morale problems and hostility between employees and managers. It said several employees expressed concern "that violence in the workplace could result because of the high levels of workplace animosity and tension." The report called for the current director of the office to be replaced. Crowley acknowledged "a serious morale issue" in the office and said it was being addressed. I'll have to see the report for myself before coming to any conclusions. It's better to be hated for what you are, than loved for something you are not ...... Unless you're a CIA officer working under official cover, in which case it's more or less a wash. If the terms "Epic Beard Man" and "Amber Lamps" mean nothing to you, then I congratulate you for having better things to do with your free time than watch YouTube videos. But, on the other hand, you're missing one of the most tragicomic things that I've seen in years. And the many interpretations, parodies, and remixes of it that pop up every day say more about inter-racial relations in contemporary America than I could absorb in a month of seminars. U.S. 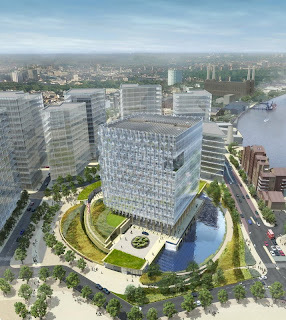 Ambassador to the United Kingdom, Louis B. Susman, and Acting Director of the Bureau of Overseas Buildings Operations, Adam Namm, announced today that KieranTimberlake of Philadelphia, Pennsylvania has won the design competition for the New London Embassy. KieranTimberlake’s design met the goal of creating a modern, welcoming, timeless, safe and energy efficient embassy for the 21st century. Their concept most fully satisfied the requirements outlined in the design competition’s mission statement. The concept holds the greatest potential for developing a truly iconic embassy and is on the leading edge of sustainable design. KieranTimberlake is an architectural firm known for its commitment to innovation and environmental responsibility. Starting with 37 architectural submissions, the Bureau of Overseas Buildings Operations narrowed the list to nine firms. A distinguished jury of both American and British leaders in the fields of architecture, academia and diplomacy selected four firms for the final phase of the competition. The four firms explored the symbolism of the embassy, its presence and position in the cityscape of London. Their goal was to create a building and site complex with a timeless quality to appropriately represent the United States of America in the United Kingdom. The four competing architectural firms, KieranTimberlake, Morphosis Architects, Pei Cobb Freed & Partners and Richard Meier & Partners, worked for nearly a year and made presentations to the jury which then recommended the winning design. As KieranTimberlake moves forward with the design of the building, the Bureau of Overseas Buildings Operations and KieranTimberlake will be actively engaged in the consultation and planning process involving the Mayor’s office, the Wandsworth Borough Council, the Commission for Architecture and the Built Environment, as well as residents in the area to ensure that the new embassy provides an appropriate home for the United States of America in London. The anticipated ground breaking on this landmark embassy will be in 2013 with a goal to complete the construction in 2017. Jane Loeffler, author of "The Architecture of Diplomacy," a history of U.S. embassy facilities, praised the selection. "They really want to make this a positive statement and it looks like they are doing that," said Loeffler. "It is very fashion forward, but it's not just trendy; it has rationale and science behind it." The winning design's emphasis on sustainability isn't just trendy architectural positioning, argues Loeffler. It is symbolically important as a diplomatic gesture. It also demonstrates how sustainability and security are interwoven in embassy architecture. A structure with its own water and energy sources isn't just kind to the environment, it's self-reliant during a crisis. Loeffler cites the example of the U.S. Embassy in Haiti -- an exemplar of the State Department's recent more fortress-like structures -- which withstood last month's devastating earthquake and has kept functioning through the aftermath. The winning firm is tooting its horn today, and provided the public with several conceptual renderings of that symbolic-secure-sustainable design, such as the one above. The concept looks perfectly fine to me, not that I know anything about art. I see that it provides the necessary setback distance from potential vehicle-borne explosive devices via barriers that are discretely cut into the landscaped hillside on the back of the building and by the water feature on the front (prediction: before construction is finished, DS will be blamed for requiring moats), and, according to the WaPo story, the facade of the building is designed of blast-resistant glass and polymer skin. I'm sure this building can be made fully compliant with all the current embassy security standards, however, I expect it will be at a far greater cost than would have been the case with a more conventional concrete-and-punched-windows building. If the State Department chooses to do one artsy new embassy in London at the cost of three or four unrefined standard design embassies in other places, well, that's a management decision, and I assume the people in charge must have made that trade-off after due consideration. I also note that this new embassy will contain just the chancery building, and none of the other stuff that has commonly been provided on new embassy complexes for the last ten or so years - no Chief of Mission Residence, Marine House, warehouse, parking lots and service bays, etc. Of course, I suppose that one advantage of building a new embassy in a nice place like London is that you don't need to provide the on-site amenities that are required in the third world, such as commissaries and recreational facilities. Because of that downsized space requirement, the London embassy can be built on a site of only five acres, versus the ten or more acres that are customarily needed to meet new embassy space requirements. Upon some reflection, I see that what we have here, security-wise, is a modern version of the motte-and-bailey castle, a type of fortification that was common in the UK once upon a time. Elegantly simple, and culturally sensitive to boot. Now, just so long as the British no longer build trebuchets, the new embassy ought to be in good shape. As a matter of historical study, however, we have too long been at pains to separate the diplomatic from the military. These are conceived as different fields of inquiry, and camps of historians working each side of this street have looked askance at colleagues on the other curb. Academic programs did not require much in the way of training across these subject boundaries. As for the relevant professional organizations, the Society of Historians of American Foreign Relations and the Society for Military History, for a very long time you could not find a historian who held membership in both those groups. Then there was one, then a few. The situation today is somewhat better but still far from where it needs to be. Diplomatic historians tend to regard military specialists as too narrow, military historians tend to see diplomatic experts as naïve and superficial. Not only does this bifurcation exist in an environment in which both schools of history are under challenge from other historical specialties, but in a real world in which, as argued here, both disciplines are necessary to properly analyze developments. I wonder how long the Federal Government will have to go work this summer, given all the snow days they've taken? The National Security Archive at The George Washington University has posted a new collection of documents on the CIA's declassified history of the Glomar Explorer, the 1974 attempt to covertly raise a sunken Soviet submarine from the Pacific floor. Washington, D.C., February 12, 2010 - For the first time, the Central Intelligence Agency (CIA) has declassified substantive information on one of its most secret and sensitive schemes, "Project Azorian," the Agency codename for its ambitious plan to raise a sunken Soviet submarine from the floor of the Pacific Ocean in order to retrieve its secrets. Today the National Security Archive publishes "Project Azorian: The Story of the Hughes Glomar Explorer," a 50-page article from the fall 1985 edition of the Agency's in-house journal Studies in Intelligence. Written by a participant in the operation whose identity remains classified, the article discusses the conception and planning of the retrieval effort and the creation of a special ship, the Glomar Explorer, which raised portions of the submarine in August 1974. The National Security Archive had submitted a Freedom of Information Act (FOIA) request to the CIA for the document on December 12, 2007. Internal evidence suggests that the article was written in 1978, but it was prepared at such a high level of classification that it was apparently unpublishable until the Agency made decisions in 1985 to downgrade it to "Secret." The basic story has long been in the public sphere, but these documents fill in the background and add some new information. The Hughes Glomar Explorer's recovery operations were greatly complicated by almost 14 days of near-continuous surveillance of the ship's work by two Soviet naval vessels. Despite the presence of the Soviet surveillance vessels, recovery work did not stop. But fearing that the Soviets might try to land personnel on his ship by helicopter, on July 18, 1974, the CIA mission director on the Glomar Explorer ordered crates stacked on his ship's helicopter deck to prevent the Soviets from landing on it. According to the article, orders were given to "be prepared to order emergency destruction of sensitive material which could compromise the mission if the Soviets attempted to board the ship. The team designated to defend the control room long enough to destroy the material ... was alerted, but guns were not issued." Ah, the good old days. Intrusive surveillance ... emergency destruction drills ... internal defense preparations ... 'they-wouldn't-really-do-that-would-they' thoughts. All merely the stuff of Cold War nostalgia now, but they were very real concerns during the 1970s. These documents are the first materials related to "Project Azorian" to be declassified other than for a video of the burial at sea of six sailors whose remains were recovered inside portions of the sub that were raised. The tape was delivered to the Soviet Union in the 1990s, and was subsequently released pursuant to a Freedom of Information Act request made to the CIA. "So long as men and nations are suspicious of each other, instruments of war will be constructed and brave men will die, as these men have died, in the service of their country." Taking my Cold War hat out of storage, I could nit-pick that language. Are there not good reasons for suspicion and military preparation when some men and nations are held captive by others? And, weren't the military forces of the Soviet Union acting not in the service of a country or nation - the legitimacy of national identity being denied by Marxist-Leninism - but rather in the interests of the working class, a social construction that theoretically gave the Soviet Union a justification to insert itself anywhere in the world? But, that no longer matters. The Cold War is over, we won, and today I'm happy to simply accept the humane and generous sentiments of that burial ceremony on board the Glomar Explorer. Of course, it's easy to be generous to an enemy after he's defeated. Should The Federal Government Remain Closed Tomorrow? You can cast your vote here, at a WaPo poll. The options are: stay closed, open with unscheduled leave, open as normal, or open two hours late. The ferocity of the storm that swept through Washington left Metro officials anticipating that the system will only have run rail service underground Thursday and will limit bus and MetroAcess services, or suspend the latter operations altogether. On Wednesday, the transit agency stopped workers from clearing tracks and stations as blizzard conditions caused three- to five-foot snow drifts. High winds were making conditions unsafe for workers, said Metro spokeswoman Lisa Farbstein. "Mother Nature has the upper hand right now," she said. "Whatever we clear gets covered up immediately." Metro has barricaded escalators at some stations to keep out the snow, meaning elevators offer the only access. Strong winds blew a door off its hinges at Largo Station, Farbstein said. Metro has stored an unprecedented 506 train cars in underground tunnels and is running 76 cars in its limited underground service Wednesday, officials said. As of noon, 11,000 trips had been taken on the rail system Wednesday. We should get an announcement in a few more hours. Update (7 PM): Federal agencies in the Washington, DC, area will be closed Thursday, February 11. What should the federal government do on Thursday? The "snow emergency" here is turning serious. Local governments are suspending snowplowing operations due to conditions, and the local power utility company is halting efforts to restore power to customers. Local schools systems are announcing they will be closed for the rest of the week. I expect the Federal government will follow suit, even though the Office of Personnel Management must be under considerable pressure to avoid a five-day shutdown in a week that follows a Friday early closure and precedes a Monday Federal holiday. Reportedly, one reason that OPM is holding firm on the government shut-down is the slip-and-fall injury that a White house staffer sustained on Monday. Frankly, it's better for people to stay home and out of the way of recovery efforts. The National Weather Service on Wednesday used the phrases "extremely dangerous" and "life-threatening blizzard" to describe conditions in Baltimore and Washington, which have both set records this week for the snowiest seasons ever. Wind gusts have reached as high as 60 miles per hour as the blizzard passed through the region. The Washington Post reports that Pepco, the local electric utility, has suspended repair operations for the 3,500 homes in the Washington and Maryland suburbs that are still without power after the weekend's storms. Alexandria, Va., emergency services also issued a warning, "Due to blizzard conditions and near-zero visibility on the roadways, to protect the safety of city employees and residents, all snowplowing operations have been temporarily suspended until weather conditions improve." At least somebody is having fun. I just saw a local TV news report about kids snowboarding off the roof of a house. "Blow, blow, thou winter wind." And so it has, with gusts up to 40 MPH today, our third consecutive day of government shut-down in the Washington, DC, area. "Tomorrow, and tomorrow, and tomorrow, creeps in this petty pace from day to day." As I look out the window at another foot of snow that has fallen overnight, right on top of all the driveways and sidewalks that I cleared off just two days ago, this is getting old. 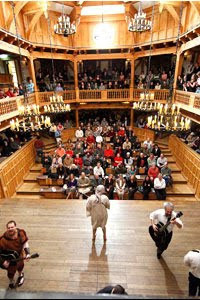 But, "sweet are the uses of adversity" in Staunton, Virginia, where the American Shakespeare Center is offering a sweet, sweet, deal to anyone who can get there this week: $10 tickets to all plays at the Blackfriars Playhouse. "The play's the thing" and they'll go on whatever the weather, so, if you can get there, you can watch them all day and night for a pittance. "Shall I compare thee to a summer's day?" I would, if only I'd had the foresight to get a room at the hotel next door to the Blackfriars a few days ago before this mess began. Lesson learned. U.S. Federal agencies in the Washington, DC, area will be closed for an almost-unprecedented third day in a row tomorrow. So much free time on my hands piles up, and being cabined at home erodes the normative behaviors that are learned in the workplace, making me perhaps a little bit giddy. And next Monday is a Federal Holiday! As I spend my second day in a row of enforced idleness at home (and contemplate a third day, since the Federal government will be closed again tomorrow, Wednesday, February 10), I've been following the news from Haiti about the ten U.S. citizens who are being held pending charges in connection with the attempted removal of Haitian children to the Dominican Republic. The New York Times had as much information as any source I found today (Americans Jailed in Haiti Plead for Help From U.S.), and its story focused on the purported lack of effective assistance from the U.S. government. [Laura Silsby, the leader of the group of Americans] said that no one, including American officials and the group’s original lawyer, had informed them of the status of their case. The only thing they have been told, she said, was that the judge would hear each of their stories and if they were consistent, they would be released. “I’m not sure if anyone from the government is doing anything for us,” she said. Well, I'm sure that someone from the U.S. government is doing something for them, since they are U.S. citizens in need of protective services abroad, however, we won't hear about it from official spokesmen since the details of their cases are privileged information. On the other hand, to judge from the 800+ reader comments that have been posted to the NYT story as of 7 PM tonight, any assistance rendered to the ten detainees would be too much. There is not much sympathy out there for the Haiti Ten! The Office of Personnel Management (OPM) made the announcement at 7:17 PM tonight. All local schools and many offices had already announced closures for tomorrow, and some of them for Wednesday, too. OPM is being, perhaps, excessively cautious. According to the WaPo, it's the first back-to-back closure since 2003. Nevertheless, speaking as someone with kids in school and a schoolteacher wife, I welcome the unexpected family vacation. Federal agencies in the Washington, DC, area are closed for Monday, February 8. Of course, what with Blackberries and OpenNetEverywhere, I'm at least 50% 'at work' anyway, even while at home. 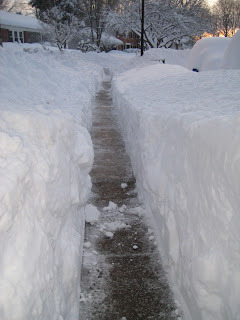 Still, I can use the day off to clear away more of the two feet of snow that fell on my home and neighborhood over the weekend. I did a pretty good job clearing the sidewalk today, if I say so myself, but that's just a down payment in a snowfall like this one. The Washington Times is running an Associated Press story today about a political scandal in Britain over excessive expensive claims made by members of the House of Commons, a scandal that I find noteworthy only for the piddling amounts of money involved. An inquiry into a scandal that tarnished British politics found Thursday more than half of the House of Commons made excessive or bogus expense claims worth more than [note: insert Dr. Evil voice here] $1 million. In a report that party leaders hope will draw a line under the furor ahead of a national election, auditor Thomas Legg said 392 of 752 current and former legislators he investigated - including Prime Minister Gordon Brown - must repay a total of $1.7 million. While House of Commons lawmakers claim an average of $223,000 a year in expense payments, the U.S. Congress allots each House and Senate office between $1.4 million and $1.9 million to cover expenses. Since British office holders are such a bargain compared to their U.S. counterparts, maybe we should outsource for Congressmen the same way our IT industry brings over Indian and Chinese employees? Is there such a thing as an H1-P (Politician) visa? They speak English better than the average H1-B visa-holder, they would be much more likely to integrate into our society, and they wouldn't put any Americans out of work except for a few hundred people who would be more productively employed outside of Capitol Hill anyway. What's not to like about that? But we don't need to bring over their auditors. According to the AP story, Mr. Legg's official inquiry cost about $1.8 million. In return for that cost, the British taxpayer will get reimbursement for only $1.7 million in improper expenses. A net loss! The British taxpayers should demand a second official inquiry into the cost-benefit practices of the first official inquiry. A week ago, while cleaning out my basement, I found an old box full of photos that I'd taken during 1982 and 1983 while a member of the U.S. Army and a student at the Defense Language Institute. Ever since then I've been tracking down long-lost classmates from those days, most of whom I hadn't spoken or written to in 25 years. I'd sometimes wondered over the years 'what ever happened to old so-and-so?' Now, thanks to social networking resources that didn't exist way back when, I'm beginning to learn what that particular cohort of young troops have done with their lives in the years since we lost track of one another. While I still have many old friends yet to track down, the results so far affirm my faith in my fellow military linguists. The youngest of the group returned home after completing his initial tour of duty, went to college and law school, and is now back on active duty as a JAG lawyer. Another is now an aeronautical engineer working for Raytheon. One is a successful accountant in Florida. One is a speech pathologist working with disabled children. One is the mother of three children and grandmother of one, as well as a teacher. One is a Deputy U.S. Marshal. One is back at DLI, having gone on to the Kennedy School of Government at Harvard after completing her enlistment, and then becoming a senior civilian official at the Defense Language Institute Foreign Language Center. One has remained on active duty the whole time and is now a Command Sergeant Major (that one particularly impresses me; the Army will make almost anybody a General, but it makes very few people CSMs). Another of my old friends, one who I used to think was the most staid and somber of us all, completed an overseas tour in signals intelligence and then went to law school and became a practicing attorney. Being a man of many interests, he soon developed a secondary career as a songwriter, performer and producer of alternative rock, acoustic-based psychedelic pop, and electronic music. During the late 1990s he was a pioneer of the web-based independent music business, helping artists connect directly to their consumers via the then-new media of CDs, internet radio and on-line distribution. In 2001, he and his group played live at Bob Dylan's 60th birthday celebration in Minneapolis. He hosted a podcast about indie music for a number of years, is an avid motorcycle rider, dabbles in many artistic fields, and all the while has remained an active member of the legal bar. Now, that is what I call a Renaissance Man! Most of us married, often to fellow DLI students (it isn't called the Defense Love Institute for nothing). A number of those marriages ended early, but I've found three DLI couples who are still going strong after 27 years, including me and my DLI girlfriend, Mrs. TSB. Looking at photos of us all back then - young men and women standing in formation on the parade ground, studying in classrooms, doing physical training in the afternoons, listening to language tapes at night, having cookouts on the beach near the school, drinking together at local hang-outs, escaping on weekends to the Monterrey Peninsula or the Napa Valley - and reconnecting with old friends, has been a fine way to mark the passage of time.